In comparison to other graphic novels that I have read, this one definitely has a lot more text in it. While it is a lengthy read, the plot continues throughout the novel at an appropriate pace and is very engaging. In terms of audience, I would say this is for a more advanced reader. Those starting high school and older are the most appropriate audience for this book. Regardless that the novel is full of great illustrations, all the facts are indeed scientific. 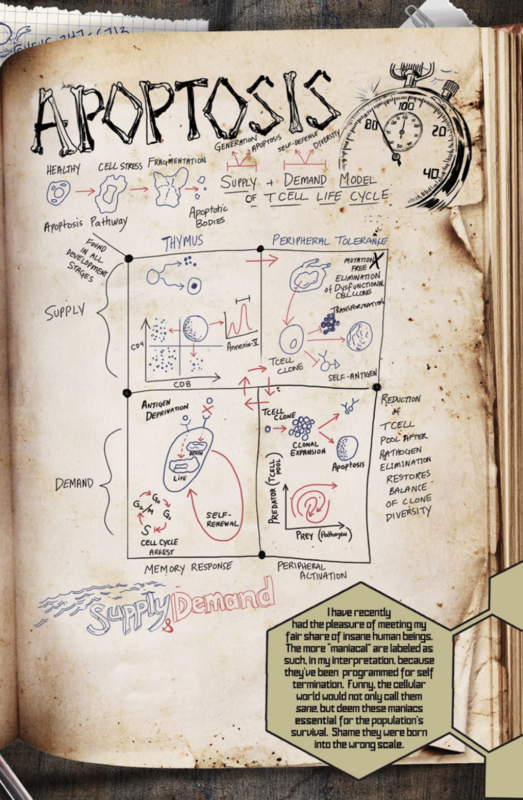 Within the first chapter, I saw diagrams for blood cells, viruses, and chemical reactions. 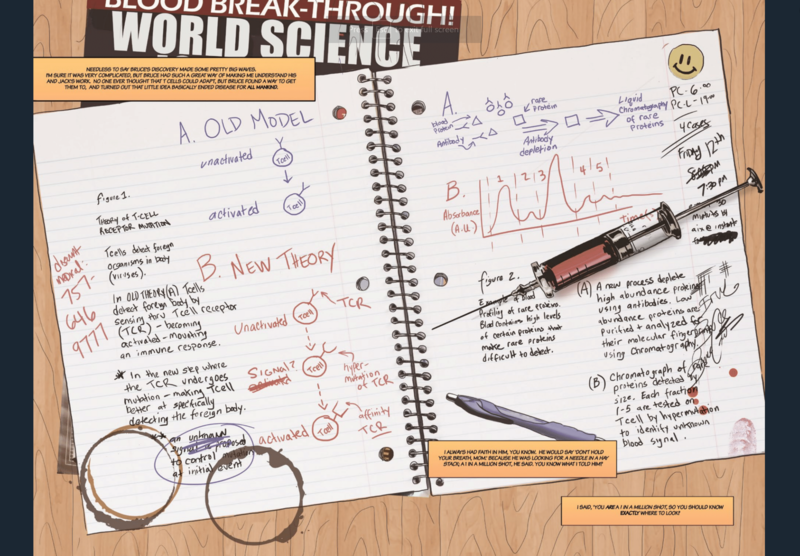 Most of these diagrams are represented through a handwritten diary from the novel’s protagonist, Dr. Bruce Abbot. And don’t worry, no spoilers here! If you want a more thorough background of the main components that the book contains, or how you can get the book, check out the official website here! Sample image of some scientific principles in the book! In just the first chapter, the novel has already mixed sci-fi, action, and art all into paper while keeping a real focus on life sciences and biotechnologies! Legend of Sumeria is definitely a novel I look forward to finishing this summer! Parekkadan, B., Webb, J., Lagaipa, A. (2017). Legend of Sumeria. http://legendofsumeria.com/. Parekkadan, B., Webb, J., Lagaipa, A. (2017). Sumeria-book-cover [Digital painting]. http://legendofsumeria.com/. Justin Blaylock is an undergraduate at the Georgia Institute of Technology, majoring in Biomedical Engineering. He is involved in several engineering clubs on campus, and interested in drug design and delivery and pharmaceutical engineering processes. When Justin is not studying, he enjoys drawing and painting artwork, and completing D.I.Y. (do it yourself) projects.